I am looking for a curve fitting method that provides upper and lower bounds confidence intervals for the fitted curve which is illustrated as figure below. Assume that the red solid curve is the fitted curve that could be obtained by ordinary curve fitting tools. 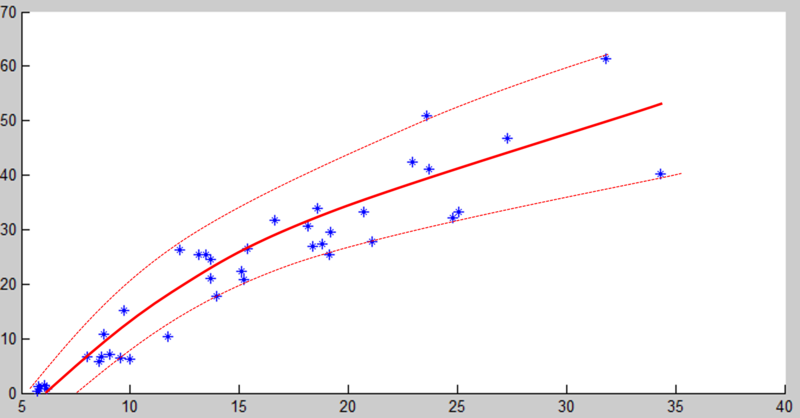 However, such curve somehow predicts the expected values. I am looking for the dashed curves that are upper and lower bounds for the fitted curve. Note that my data have heteroscedasticity properties. Any help is much appreciated. You can use the geom_smooth() function of the ggplot2 library in R.
Not the answer you're looking for? Browse other questions tagged confidence-interval stochastic-processes heteroscedasticity curve-fitting or ask your own question. 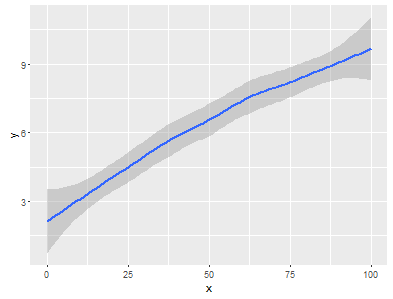 Linear-logarithmic Regression in MATLAB with two input arguments - which model to assume? How can I find the k-nearest neighbors for a collection of linear time series data?